One of West Virginia’s brightest scientific stars has a brighter future. Last month, U.S. Senator Jay Rockefeller announced that, following several months of funding uncertainty, West Virginia University has signed an agreement with the National Radio Astronomy Observatory (NRAO) to invest $1 million over the next two years to help underwrite the costs for personnel and operations associated with the Robert C. Byrd Green Bank Telescope. 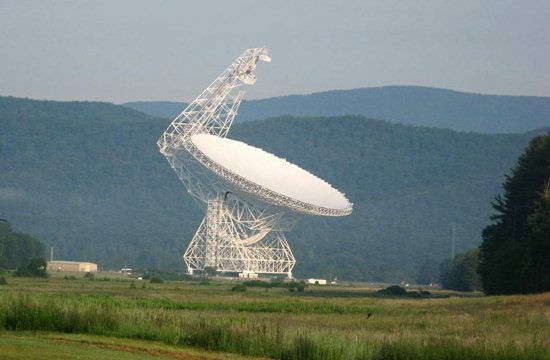 The NRAO operates the Robert C. Byrd Green Bank Telescope, which is the world’s largest, fully steerable radio telescope, on behalf of the National Science Foundation (NSF). As the funding threat loomed, Senator Rockefeller worked with Rep. Nick Rahall and U.S. Senator Joe Manchin to convene meetings of high-level officials from WVU, NSF, and the NRAO to discuss the facility’s future operations. The Green Bank Telescope will track NASA’s Voyager I Spacecraft, which left the solar system in August, becoming the first man-made object to enter interstellar space. Read more about Voyager I at http://voyager.jpl.nasa.gov/.